Wire Heads - try 'em you'll like 'em. I've been making these "Wire Heads" here in NY for many years. A friend asked me to share them with you, so here they are. I'm sure others have made similar heads in the past, but if so, I've never seen them. Please check out my "how to" video's below, enjoy. These videos are a bit rough and unedited. I hope you find them "good enough" for this demo... Doug. 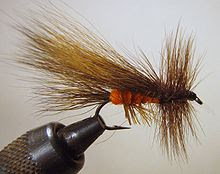 Note: I also tie; PT, GRHE, RS2's and several other nymphs like my version of the Copper John with wire heads. Here are a couple of photos of the Wire Heads using UV resin to coat the head after it has been formed by the wire. This makes an extremely durable and shinny head. Parks Salmon Fly: Created in 1954 by Merton Parks, this is the original version of the Improved Sofa Pillow. Fish it damp as often as floating high, especially at the tail end of the salmonfly hatch. Richard Parks, Merton's son is the owner of Parks Fly Shop located in Gardiner, MT at the north entrance of Yellowstone National Park. http://www.parksflyshop.com/ This is my favorite Salmon flypattern, highly effective and a Yellowstone area classic. Removing the chaga does no harm to the tree nor does it save it, but non-the-less it makes a wonderful tea. Or so I've been told. Chaga has been used for century's by our native americans for brewing an herbal tea rich in anti-oxidants. So, today I thought I'd make some and give it a try. How was it? Great, very nice, tastes like a green tea... Anybody that knows me, knows that I'm not a fungus or mushroom fan but from now on I will keep my eyes open for more Chaga. Note: Michelle passed on the tea... only good english teas will do for her. I find that a "bit snobbish", don't you?